Astronomers Find Trio Of 'Super-Earths' Around Nearby Star : The Two-Way New observations of a fairly well-studied star have revealed a system with at least six planets, three of which are in the star's habitable zone. This is the first time that three such planets have been spotted orbiting in this zone in the same system. 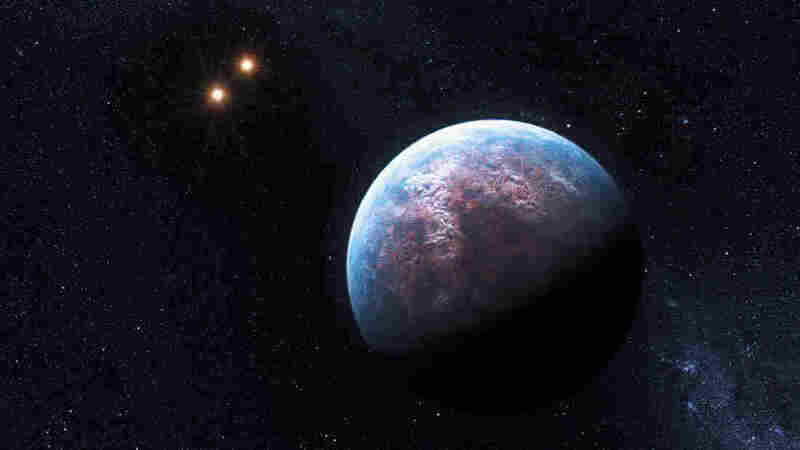 An artist's impression of one of the super-Earth's surrounding the star Gliese 667 about 22 light years from Earth. New observations of a fairly well-studied star have revealed a system with at least six planets, three of which are in the star's habitable zone. This is the first time that three such planets have been spotted orbiting in this zone in the same system. At just 22 light years away from Earth, Gliese 667 is a relatively close — in space terms anyway — triple star system. One of those stars, Gliese 667C, has been heavily analyzed in the past, but a team of international astronomers decided to combine data from the European Southern Observatory's (ESO) Very Large Telescope (VLT) in Chile with existing observations. Gliese 667C is a low-luminosity "M-dwarf" star just over one-third the mass of our Sun. What they found were six planets, including three large, rocky super-Earths — planets more massive than Earth, but less massive than planets like Uranus or Neptune — orbiting the zone around Gliese 667C where liquid water could exist on the surface, thus making them possible candidates for the presence of life. "We knew that the star had three planets from previous studies, so we wanted to see whether there were any more," said Mikko Tuomi of the University of Hertfordshire, U.K. "Finding three low-mass planets in the star's habitable zone is very exciting!" Tuomi told BBC news that the orbital periods of the three planets are "28, 39, and 62 days, which means that they all orbit the star closer to its surface than Mercury in our own system." The estimated surface temperatures, however, enable the existence of liquid water on them because of the low luminosity and low mass of the star, he said. "The two other stars of the Gliese system would appear as very bright stars visible in the daylight on these planets. They would produce as much nighttime light as the full moon does on Earth. These compact systems with small stars and close-by rocky worlds have been theorized by astronomers, but this is the first one which fulfills all the requirements." "It is very good to also see several independent research groups exploiting this unique instrument and achieving the ultimate precision," said Gaspare Lo Curto, The ESO scientist responsible for HARPS. The planets would still need an atmosphere to sustain liquid water on their surface, but at the distance scientists are studying them, about 129 trillion miles, there are no means to determine what the precise conditions are like.